A great weekend for mowing and for birds. Mike was excited to mow after so many wet days last weekend, so he worked on 3 different areas. The first one was the point below Hidden Oaks Prairie. 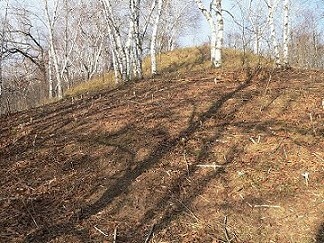 We had cleared the bottom of the point last winter by hand – liberating some small oaks and a large Hawthorne that were choked by birches and prickly ash. This time, with the powertrac, Mike was able to mow all the way up the slope – all the way to the edge of the prairie. Now that the brush is all mowed out, we’ll go back and cut the birches and then we’ll be able to see all the way from the planted prairie below up to Hidden Oaks Prairie on top. Most of the trees on the east side of the hill are aspen, so we need to girdle them and wait for them to die before we can cut them. 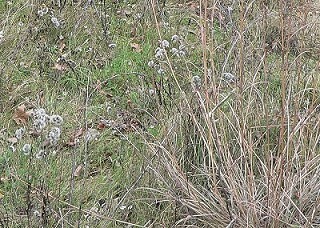 There are some savanna plants under the brush, but I don’t know how many – it will be interesting to see what comes up. Here it is partially mowed – you can see the area we cleared last winter on the left. 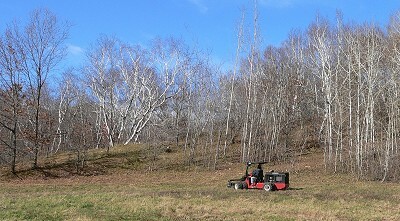 This is looking from a mowed area up to the prairie on the point – lots of birches to cut. The second project was the area just south of Volvo Meadow, between Willow Road and our new prairie planting. I’ve only walked in there a few times because there was so much brush, but there are prairie plants, and only small trees – mostly Box Elder. I hadn’t realized the area was so big – I suggested it as a quick easy project, but it took all day Sunday. 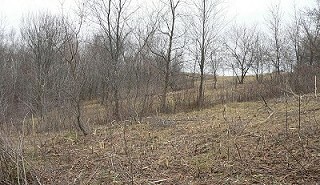 Here it is – we didn’t take any ‘before’ pictures this weekend – but this area was entirely full of gray dogwood and prickly ash before it was mowed. There are some deep gullys that run through it which can’t be mowed – some are full of brush, and others have prairie plants. Here’s one that has a big clump of Big Bluestem, and some Asters and False Boneset. The third project is the other point in 3 Finger Valley. It’s completely overgrown, but there are some areas that have prairie plants, and there are some big old oaks. It’s narrow, and so overgrown that there’s only one path that the powertrac can take. Mike tried going in a different way and got stuck between some birches – and discovered that it is possible to bend the heavy metal roof. By the time we got the powertrac unstuck, he discovered that some of the tires were flat, and it was too late to do any more – that will have to wait for next weekend. I worked the whole weekend on staking the field for the prairie planting we’ll do this winter. I’m trying a new method of dividing the field so it’s easier to stake and hopefully will be easier to plant. It’s a long, not very interesting project, but it’s about 2/3rds finished – I have to finish before the ground freezes. This is part of the field I’ve finished staking – I’m using a color coding system on the stakes this time. The aurora Sunday was amazing – the best I’ve ever seen, and the first one at the farm. It covered the whole sky – it actually appeared to be centered above us – and it flickered and moved sometimes fast and sometimes more slowly. This aurora photo is the closest picture I could find that looked like what we saw – imagine it constantly moving and flickering and changing shape. 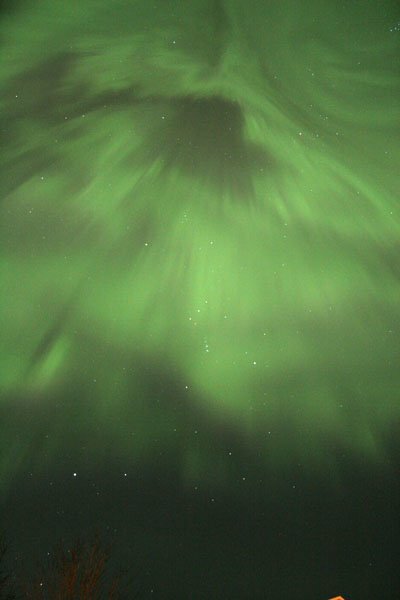 There are many more photos from Sunday’s display on the spaceweather website.